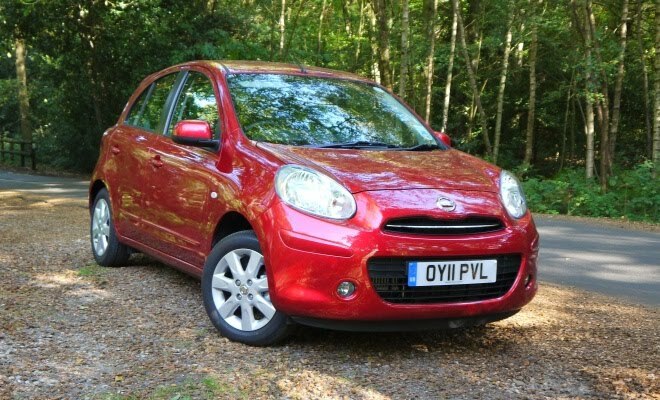 Nissan has kindly loaned me a Micra DIG-S for a week, but I won’t need seven days to make my mind up about this car’s engine. A few hours has convinced me that the DIG-S motor - a 1.2-litre, 3-cylinder, supercharged petrol unit - is a work of art. 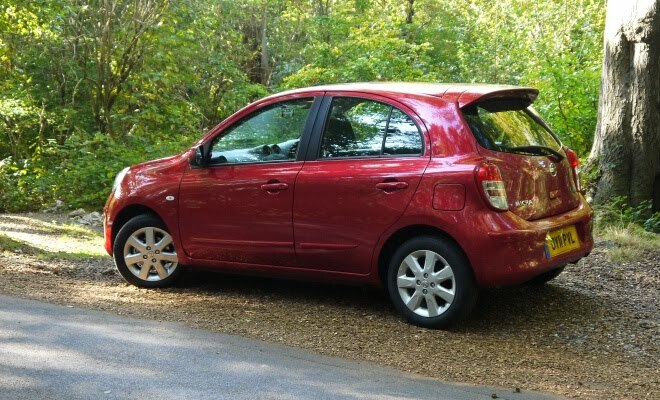 It’s smooth, responsive and strong, makes an engaging array of noises from hums to purrs to whistles, and is delivering well in excess of 40mpg. I’d like to say exactly how much in excess of 40mpg but I simply don’t know. The mid-range Acenta trim level includes a basic trip meter, but the economy figure doesn’t seem to want to zero, despite much prodding of the control spindle poking out of the dash. When the car arrived it said 39.4mpg, presumably averaged across the 3,000-odd miles of its life so far, and it has since crept up to 41.2mpg in steady steps of 0.3mpg over about 50 miles of mostly urban pottering. So I’m evidently doing better than previous drivers, but I can’t be sure by how much. The official numbers, for whatever they’re worth, are 65.7mpg on the combined cycle and 99g/km for my manual version - there is also a CVT option, but it increases the CO2 output to an unseemly 115g/km. I’m pretty sure I haven’t been troubling the economy meter, which maxes out at 60mpg, but I’ll happily accept the zero-cost tax disc and free entry to the London Congestion Charging zone, both of which come courtesy of dipping under 100g/km. Unlike most of its sub-100-gram competitors, the Micra DIG-S doesn’t cough out diesel particulates or much in the way of NOx pollution to ruin the air - plus it has no particulate filter to clog - so it’s actually a good choice if most of your motoring is London trundling. Like an increasing number of engines, this one achieves good test results by providing a stop-start system to avoid wasting fuel while idling. Combustion ceases when the car is warmed up, sitting stationary and in neutral, and restarts promptly with a muted whir as soon as you brush the clutch pedal. It’s better than some systems I’ve tried, notably because it keeps working in traffic jams, not needing to reach any particular speed before it’s ready to shut down again. But it’s a little below par on those occasions where the lights change just as the engine dies. Push the clutch pedal at the moment the revs drop and the system needs to stop and think for a moment before restarting. It’s not a big issue, it’s just not quite as immediate as some of its stop-start rivals. The DIG-S unit is a clever little beast. Variable valve timing allows it to operate in both Jekyll and Hyde modes. Under modest loads at low revs it uses the Miller combustion cycle, shortening the time the inlet valves stay open to limit cylinder pressures and save fuel. At higher revs, cylinder valves stay open for longer to let the engine operate in the conventional Otto cycle mode. Fuel is injected in precise amounts directly into the cylinders, and a supercharger can be switched on or off as needed to pump extra air in for additional combustion power. The results are the above-quoted emissions coupled with a 98bhp power peak and up to 142Nm of torque. None of the engine’s complexity is apparent to the driver, of course - only the resulting flexibility and frugality are obvious. Unusually for a modern, eco-label car, the dashboard gives no hints about the best moments to change gear, so timing is left as an exercise for the driver. When you do decide to swap cogs, the shift action feels as sharp as a new blade, although it does summon up fourth and fifth gears that feel a little on the long side. Don’t expect much acceleration up motorway inclines in top. The long gearing does mean that engine noise is virtually absent at speeds around the legal limit. Tyre roar is always modest but there is a noticeable amount of wind whistle around the screen pillars at 70mph. At least the windscreen affords a good view. The pillars are slim and well placed by modern standards, and this is the first new car I’ve driven in years where I could see any of the bonnet, flanked by tiny rounded wings. The good forward view is mostly due to a seating position that feels more barstool than armchair. The side windows are also usefully deep, unlike the slanted, medieval visor slots that seem to have become the norm even among supposedly urban cars. 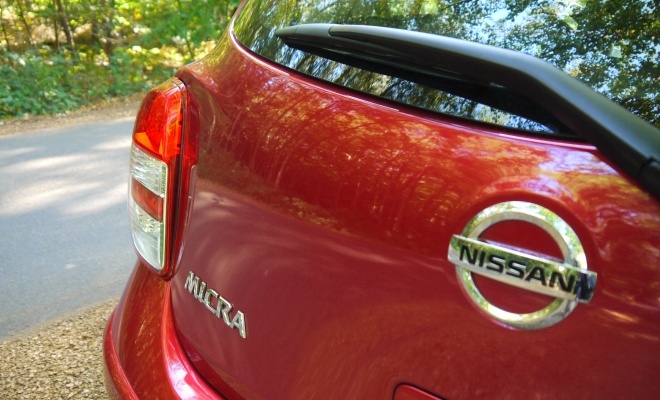 If rakish, wedge-shaped windows are in vogue then the Micra isn’t, but I’m not complaining. The engine may be a peach, but the suspension unfortunately is not something to be savoured. On the scarred and scabby patchwork of London’s streets the ride rarely felt better than unsettled, fidgeting constantly between bouts of crashing and bouncing. The relatively crude torsion-beam rear suspension is presumably the main culprit, although I’m not convinced the front struts have been particularly well tuned for UK roads either. The rear underpinnings are at least compact, yielding a square, flat-floored loadspace of 265 litres with the seats up, or a very usable 605 litres once the rear seats have been folded and tumbled forward. The rest of the interior won’t win any prizes for opulence. The upholstery is pleasant enough and nothing squeaks or rattles, but the plastics are drawn from the brittle bottom of the polymer barrel. 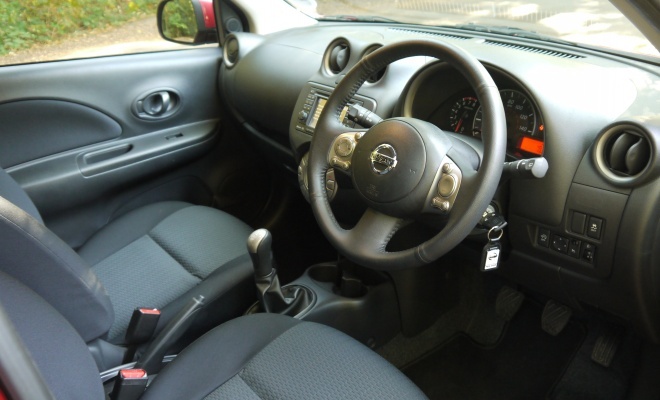 And while the centre console shoots for iPod chic with its circular motif, the buttons feel more Alba than Apple. 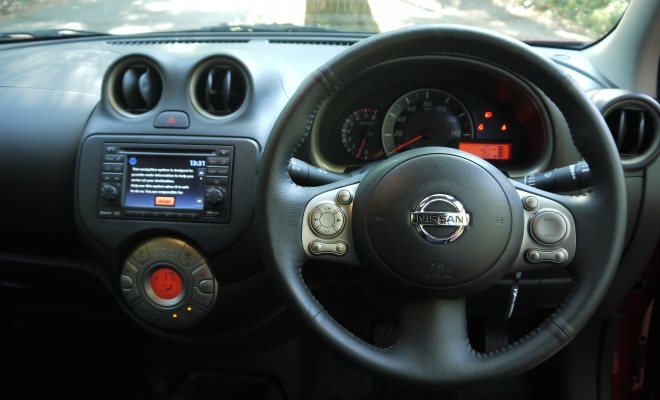 My car includes an optional Nissan Connect pack, which for just £400 brings a six-speaker audio upgrade, Bluetooth phone integration, USB and Aux-in sockets, and an excellent five-inch, touch-screen satnav. For that price, I’d say the pack is as optional as breathing. Together with metallic paint and a set of mats, the electronics bring the total outlay for my test car to £13,011 – up from the basic on-the-road cost of £12,150 for the Acenta trim with the DIG-S engine and 15-inch alloys. The same engine can also be twinned with the more basic Visia trim from £11,150 or the top-spec Tekna format from £13,650. Those prices are £1,000 more than the same car with a less frugal, more basic, less powerful 1.2-litre petrol engine. For my money - if it were my money - that would be a grand well spent. That’s assuming you have your heart set on a Micra, which is obviously not a given. 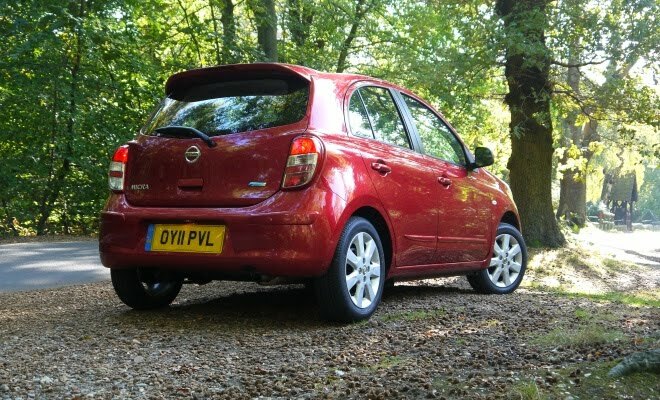 The Micra really needs to be better, its shortcomings brought into sharp relief by such an exceptional engine. Let’s hope Nissan can at least sort out the ride - or perhaps find a more suitable home for its little mechanical peach, and soon.